At a rally in the Kent constituency, Reckless – by name and nature it would seem - referred to the growing numbers of migrants trying to make the dangerous voyage across the Mediterranean Sea to Europe. "Whatever people say about Gaddafi", he remarked, "one thing is he didn't allow those boats to come across". "He had an agreement with Italy that stopped it. Since he's gone we have no idea what's going on in Libya, it’s too dangerous for anyone to go there", he added. According to the Mail, these remarks are being compared to the famous last excuse for Fascism, "say what you like about Mussolini, he made the trains on time". But they are far, far worse than that comparison would imply. They are more like applauding Hitler for keeping Jews out of Britain by putting them in the camps – for that is precisely what Gaddafi was doing with migrants passing through his territory - with the complicity of the EU. Altogether, the Gaddafi regime was responsible for the deaths of thousands, if not hundreds of thousands of migrants. Yet – despite that – Italy in 2008 concluded a "Friendship Agreement" which had Gadaffi agreeing to step up border controls and to take back "expelled foreigners" from Italy, all in exchange for Italy agreeing to provide Libya $5 billion in infrastructure projects over 25 years. Italy was already paying for charter flights for Libya to send the people "home", and had between August 2003 and December 2004 transported 5,668 people to Libya, despite known human rights abuses. On the back of the agreement, in May 2009, Libya and Italy also launched joint naval patrols in Libyan territorial waters for an initial period of three years, the controversial practice of "push-backs" (respingimento) which was subsequently condemned as breaching human rights law. 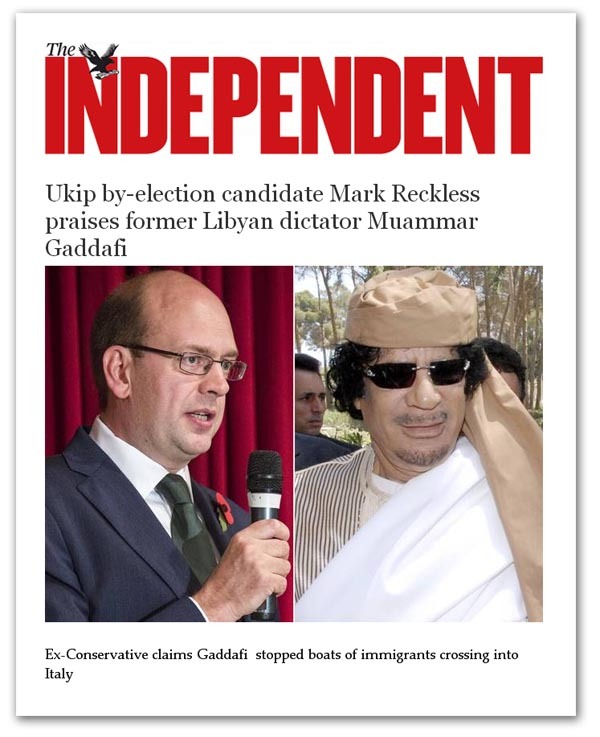 Thus, while no one is going to argue with Reckless's general theses that things are no better in Libya now, after western intervention, to applaud a dictator for his human rights abuses is not the most sensible thing for a politician to do - unless, of course, he represents UKIP. Enter now Mr Farage who was given the opportunity to implement a deft piece of damage limitation, only for him to agree with Reckless (and incidentally support EU policy), bemoaning the removal of somebody, "albeit an Arab nationalist dictator, who actually gave a level of stability to the area". Thus we have senior UKIP politicians applauding a dictator's use of death camps – a means of immigration control which clearly has the approval of Messrs Reckless and Farage. And with that, it is perhaps unsurprising that UKIP is reluctant to commit its policy to writing – unless, of course, it is waiting for the translation from the original German.